Despite strong opposition from industry lobbies and within the Duma itself, the measure passes, putting an end to 18 years of negotiations. This week the Russian State Duma ratified the protocol on Russia’s accession to the World Trade Organization (WTO), by a vote of 238 for and 208 against. As reflected in the vote, the debate on the floor of the Duma over the bill was intense. The opposition objected vehemently to ratifying the protocol, predicting dire consequences for the country, including economic collapse. However, the votes of the ruling United Russia party in favor of the bill were enough to pass the measure. The Constitutional Court previously ruled that the WTO bill was in line with Russia’s legislation. Russia will have to notify the WTO secretariat of the ratification and, then, in a month’s time, the country will become an official WTO member. 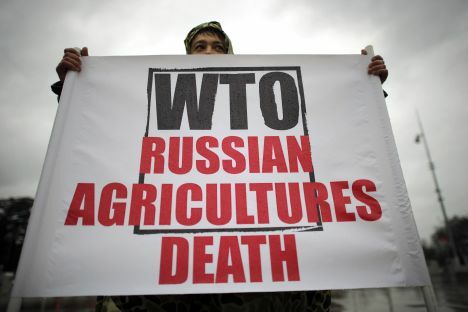 Duma deputies from the Communist Party of the Russian Federation (KPRF) are certain that WTO accession will only have negative consequences for the economy. KPRF Deputy Nikolai Kolomiytsev said that the document lacked provisions to protect Russian agribusiness and other economic sectors. Russia is being “driven to the place of execution,” he said, citing the example of Ukraine, which was accepted into the WTO three years ago and has since observed a slump in production. Members of the Liberal-Democratic Party of Russia (LDPR) also voted against the bill. “We are strangers in the WTO,” LDPR leader Vladimir Zhirinovsky snapped. According to Zhirinovsky, Russia can produce, but cannot sell. Deputy Mikhail Yemelyanov of the Just Russia party called adoption of the bill a “life-changing” decision for the country. “Why are we acceding to the WTO now and agreeing to these terms?” Yemelyanvo asked rhetorically. Generally a country benefits from accession if its domestic market is filled and when it makes competitive products. Russia’s non-mineral exports account for 19 percent of total foreign supplies and machines and equipment for only 6 percent. Yemelyanov calculated that the country’s membership in the WTO will strip it of 3 percent of GDP by 2020; he also argued that Russian consumers will also see no benefits from the deal. “In the early 1990s, our economy was more open than it had ever been. We thought we would be joining the global family of civilized nations, that we would be drinking French cognac and wearing American jeans. What do we have instead? Whiskey bottled in Poland, perfumes from the same place, and Turkish and Chinese jeans,” Yemelyanov said. In rebuttal, the United Russia deputies insisted that accession to the WTO opened up new opportunities for Russia. Igor Rudensky, a United Russia deputy and head of the economic policy committee tried to convince his colleagues that the WTO meant new opportunities for the domestic economy and an impetus to modernization. Rudensky argued that Russian consumers would benefit from an unprecedented range of goods and services. Yet even the optimistic Rudensky had to admit that Russian companies would find it hard at first, until they learned how to play by the new rules and turn competitive. Theoretically, membership in the World Trade Organization should facilitate access for Russian companies to the global market and protect them against discrimination. According to the Economic Development Ministry, Russian business loses an estimated $2 billion annually because of discrimination measures. Even so, a few months ahead of the ratification, industry lobbies increased their pressure on the government and the Duma to vote against accession. They predicted catastrophic consequences for business once Russia opened its domestic market and reduced import duties, and called for new state subsidies. The most sensitive industries are the car industry, farm machine industry, agriculture and even the metals industry, which has always supported the WTO campaign. Economic Development Minister Andrei Belousov told the Duma that accession would cost the state budget almost half a trillion rubles in 2013-2014. Direct budget losses caused by lower import duties resulting from the accession are estimated at 188 billion rubles in 2013 and 257 billion rubles in 2014. Yet the real losses will be much less, the minister said, referring to the anticipated growth in trade and, consequently, the tax base. In 2013, the average customs tariff will go down to 7.4 percent from 9.5 percent; in 2014, it will drop further to 6.9 percent and, in 2015, to 6 percent. On average, the customs tariff will decrease by 3.5 points. First published in the Expert magazine.